When you stay at Aqua Beach Inn in Myrtle Beach, you'll be in the entertainment district, just steps from Myrtle Beach Boardwalk and 3 minutes by foot from SkyWheel Myrtle Beach. This hotel is 0.5 mi (0.8 km) from Myrtle Beach Room Escape and 1.5 mi (2.4 km) from Family Kingdom Amusement Park. Make yourself at home in one of the 60 air-conditioned rooms featuring kitchens with full-sized refrigerators/freezers and stovetops. Your pillowtop bed comes with premium bedding. Rooms have private furnished balconies. Wired and wireless Internet access is complimentary, while 32-inch flat-screen televisions with cable programming provide entertainment. Enjoy recreational amenities such as an outdoor pool and a spa tub. Additional amenities at this hotel include complimentary wireless Internet access, concierge services, and gift shops/newsstands. 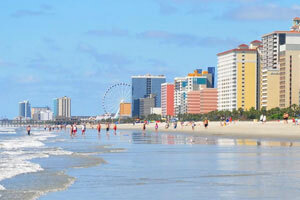 The preferred airport for Aqua Beach Inn is Myrtle Beach, SC (MYR).